Arts for Health were invited to attend the AESOP (Arts Enterprise for a Social Purpose) conference to present our Up tempo project. 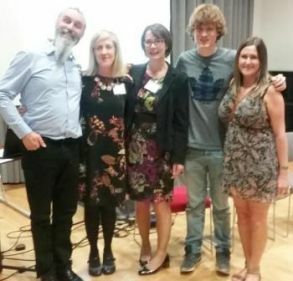 The presentation was led by Jessica Kent, Arts for Health lead, with Rachel McKeown, AHP Director of the Trust, two participants within the project: Dan and Sarah plus John Simmonds from Make Some Noise, one of the partners of the project. The Conference presentation was to an audience of health decision makers and stakeholders. The conference focussed on how the arts are contributing to current health priorities by reducing demands on the health system, addressing the neglect of mental health, supporting an ageing population and tackling health inequalities. We were presenting our UP Tempo project which has taken place over 18 months on inpatient wards and in community settings. The audience were very interested in our project, it was a great opportunity to profile arts for health as well as the success of the project and the two participants gave very honest accounts of their lives, their difficulties and experience of mental health and how they have engaged with Up Tempo and what it has meant to them – a very moving presentation by both.